When we first moved to Tisdale in the mid nineties from spring to freeze up it was routine to see one or two hopeful people with rods in their hands and a line in the water attempting to catch a trout from the deep pond. In the past five year that pastoral scene vanished as did the little pier that nestled in the north west corner. This spring after the run off and spring flooding of the neighbouring Doghide River town workmen pumped the water out of the then full pond which was originally dug as a borrow pit to provide fill for highway #3 as it leads up to the little bridge over the Doghide. Last Friday, September 18, work began on the pond with a backhoe and dozer dredging the almost dry depression. The remaining water was pumped out and on Monday work began in earnest with two buggy earth movers and two bulldozers reshaping the size and surrounding area of the pond. First the west end of it was actually filled in and what appeared to be a roadway constructed around the west and south side. The material was built up on the southwest corner to create what will be a picnic area while the north side was dug down making the shape more of an oval. The reason for the decline of the stocked trout was believed to have been caused by two factors. The most hazardous one was run off from the highway which included salt and other chemicals and the restricted volume of water. This upgrade is addressing both issues with the apparent roadway along the south (highway facing) side to form a barrier from run off from the highway while the expansion, both deepening and widening of the pond is intended to increase the size of the body of water. 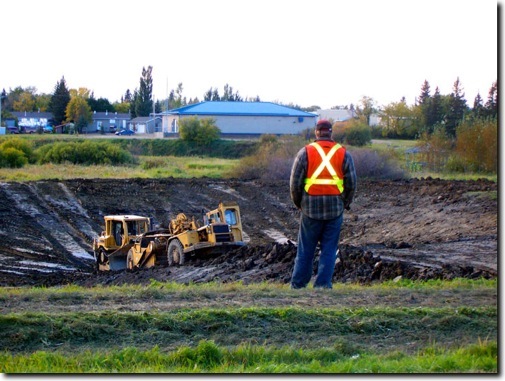 This is a major “green spot” improvement for the town of Tisdale and there is expected to be considerable landscaping around the pond to make it a beauty spot as well as cool fishing pond. It is expected that the pond will be filled in the spring with spring melting water coming from the nearby Doghide River.